GRAHAM ALLISON is director of Harvard Kennedy School's Belfer Center for Science and International Affairs and the best-selling author of LeeKuan Yew: The Grand Master's Insights on China, the United States, and the World; Nuclear Terrorism: The Ultimate Preventable Catastrophe; and Essence of Decision: Explaining the Cuban Missile Crisis. Founding dean of the Harvard Kennedy School, Dr. Allison has served as Assistant Secretary of Defense and advised the secretaries of defense under every president from Reagan to Obama. He lives in Belmont, Massachusetts. “The U.S. needs a strategy to deal with a China that is increasingly comfortable engaging aggressively in the world. 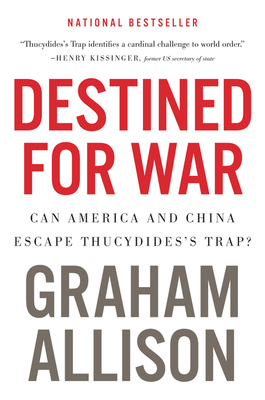 A good primer on this is Graham Allison’s recent book, Destined for War: Can America and China Escape Thucydides’s Trap? Allison, a professor at Harvard’s Kennedy School of Government, tells the story of China’s truly meteoric rise over the past three decades, and makes the point that while we are playing checkers, the Chinese are not simply playing chess — they are playing a different game altogether: Go.” — ADMIRAL (RET.) JAMES G. STAVRIDIS, Dean of the Fletcher School of Law and Diplomacy at Tufts University and former Supreme Allied Commander Europe.